Bonnie is the middle child and youngest daughter of Air Force Captain Robert N. Brumet, who was killed on April 9, 1964 when the wings on his overloaded plane fell off and he crashed into a home. The incident also claimed the lives of a Vietnamese woman and her children. Bonnie was five years old when her father died. Her memories of him are few, but reflect a resourceful and fun loving man, one who took great pride in his family. Bonnie is one of “seven sisters” going on the 2 Sides Project 2018 trip, which takes off on Saturday, November 24. One of the seven is her sister Barbara, who went to Vietnam in 2009 and jumped at a chance to return with Bonnie. Now Bonnie hopes to get to know the country and its people, and to go to that place she’s thought about for most of her life – the site where her father’s plane went down. Bonnie at the Vietnam Veteran’s Memorial in Washington D.C. on the 53rd anniversary of her father’s death. Do you have any memories of your dad? I’m not sure how old I was, but Mom was making a cake and I wanted some of the batter, so I stuck my finger in the bowl with the egg beater on. My hand got all tangled up, and I remember my dad tried to get it out, but ended up having to cut the egg beater off. We went to the hospital and, thankfully, there weren’t any broken bones. That was a traumatic memory, but I have fun ones, too. We kids used to play a game where we’d stick our heads into the back of the sofa and flip our legs over the back and stand up on the other side. Dad thought that looked like fun so he tried it, but he was too big, and the couch went over with him and fell on top of him. We all laughed, and so did he. He sounds like a fun guy. There were always parties at our house, family picnics with lots of games and laughs. My mother often said that when you got with the squadron, it was expected that everyone would have fun, and have a little too much to drink. When my parents had people over we would come down in our pajamas and salute everyone. My dad was fun loving but he was also known for helping others out. His nephew was having some trouble at home and came to live with us for a while. My dad was really proud of his family. Trying out the fighter jets on the USS Midway aircraft carrier in San Diego. What do you remember about the day your father died? Only that we were sitting in the basement crying. I guess that’s when Mom told us. And I remember the funeral and the fly by. That was all pretty dramatic for a five year old. Did things change for you from that moment on? My sister and brother were closer to my parents than me, so it didn’t change my life as much as theirs. I always felt really independent. I don’t like to depend on others. Part of that comes from losing my father. I don’t know what will happen to people; they could just be gone like that, so I never got too attached to people or places. That was probably the most influential outcome. My father’s death changed my personality. Family photo, early 1960s. Bonnie is on the right, brother Woody is in the middle, and Barbara is on the left. You had a chance to go to Vietnam when your sister Barbara did. Why didn’t you? I had some lame excuse I can’t remember. I think if she would have pushed me I would have gone. I was never brave enough to read a lot of books about the war, or watch movies about the battles. It’s all too gory for me. I can’t take it. But I want to see the country, I want to see what the battle was about. I know it was a power play and my Dad was a pawn in the whole thing. But I want to see the people. They suffered way more than we did. They are a very resilient people. They just don’t just let anyone roll over them, they fight for what they want. So I’m curious about the country and the people and how they rebounded. I think I’ll find that it’s a place worth fighting for. Bonnie competes in a canoe race in which racers have to jump out of the canoe and get back in it before they can finish. Do you feel any trepidation about going? I think a few things will be difficult. I mean how do you show or express how sorry you are to someone who lost their whole family, not just their father? How do you get them to understand? I don’t know how that will be, but I still want to meet them. On the positive side I’m expecting the geography to be spectacular. I’ve always heard it’s a beautiful country, that the beaches are beautiful, and I’m interested to see the jungles. I’ve heard about the jungles, about our use of Agent Orange, about how we didn’t know how to fight a battle in that kind of environment. It’s going to be very different. Hiking the Franconia Notch loop in New Hampshire with family. What do you hope most happens? I hope to close the loop. I hope I get closer to my father. I’m going back to my roots in a way. My dad is gone. It’s not his fault. He would be here if he could be. I’m expecting to be moved, I’m not sure how, good or bad, it will be such a different experience than anything I’ve done before. So I’m leaving myself wide open. I’m trying not to create expectations. 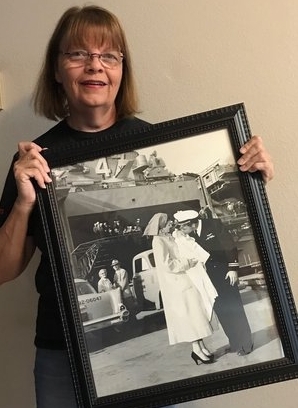 Susan is the daughter of James C. Mitchell Jr., an Electricians Mate in the Navy and a linguist who learned several languages at the California Linguistics School before he left for Vietnam. He was on assignment with Special Forces Operations on January 8, 1970 when his helicopter was shot down over the Mekong Delta near An Giang. A registered nurse from California, Susan often finds herself caring for Vietnam veterans. But it’s only been in the last few years that she has pushed herself to ask about their experience, and to share her own, fostering connections that have propelled a deeper interest in helping others heal from the war. Outside of her work, Susan serves others in many ways. She is a volunteer at her local church, working most weekends on projects that help the community’s neediest. She is also a caring sister to many other sons and daughters who lost fathers in the war, someone who makes a point to collect and share rubbings of their father’s names when she visits the Vietnam Memorial in Washington D.C. And Susan has been an active supporter of the 2 Sides Project from the start. She went on the 2015 trip, has attended film premieres in London and Florida, and regularly speaks to individuals and groups about her experiences. Susan’s passion and drive led to her recent appointment as a Senior Advisor to the 2 Sides Project. She will serve as an advisor to the trip’s participants, and continue to be an international Ambassador of Hope. 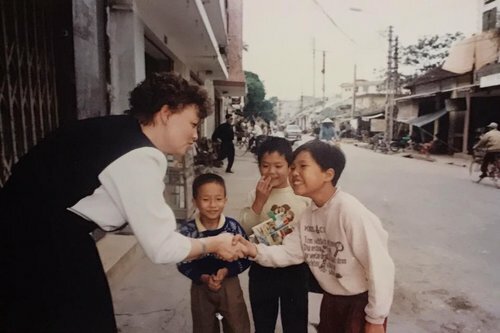 In this profile, Susan talks about what propels her to serve, the special moments she remembers from her first trip to Vietnam, and how her experience shows that sharing stories is one of the most powerful ways to connect with others. First, happy early birthday. You share it with Veterans Day. Does that explain in part why you’re so active in veterans affairs and war-related service? I think it’s part of my genetics. My grandparents came from a place of helping others. They taught us that in order to fulfill your purpose, you have to empty the cup. They passed that idea on to my mother and to us, so we’ve always been active in all kinds of community efforts. I think over the last 10 years I’ve centered more on vets, connecting with them and their stories. Before that I would see vets and wouldn’t be comfortable even saying thank you. But I have forced myself out of my comfort zone and now it seems more of a mission to hear their stories, and to tell mine. I just seem to be in the right place at the right time. A couple of weeks ago I went to Chicago on a stopover on my way to Washington DC, and had a whirlwind couple of days visiting the National Veterans Art Museum and the local Vietnam Veterans memorial. I saw the dog tags exhibit, which displays tags from all who served in the Vietnam War. I met Vietnam vets and heard their stories. And I met the museum director, who gave me a private tour. He also introduced me to the woman who created all of the dog tags using an old machine they stored in the office, which they restarted to make me a replica of my father’s tag. My family jokes that I’m living the life. I’m just connecting with people. That’s my purpose now. You were also recently in Washington, DC for the Marine Corps Marathon, right? Yes. Amy Bushatz is a reporter I met ten years ago when she profiled me during Father’s Day for The Washington Post. We’ve kept in touch, and she contacted me recently to say she wanted to carry a flag in my father’s name through her road races this year. She finished the season doing the Marine Corps Marathon, carrying the flag the entire way. She gave it to me after the race, and I’m bringing it with me to Vietnam. What do you remember most from the first 2 Sides Project trip? I’ve been looking back at all the pictures, all the moments. I will always remember one of the Vietnamese sons, Mr. Xiem, pinning a flower on my dress. It’s a clear plastic flower made by children who are living with defects caused by Agent Orange. He had been very angry in our meeting, and his hands were shaking as he put it on me, but I saw how his anger had softened as we all talked. His action symbolized there was some understanding, not necessarily forgiveness, but an understanding that we are all on the same side, the side for treating others with humanity and kindness. I still have that pin. It’s on my dresser. It’s as valuable to me as any piece of jewelry I’ve been given. Why are you going back? I have to. I think there are more connections to be made and more opportunities to help others close that hole in the soul that anyone who lost a father, on either side, knows about. That hole is now filled for me. I’m not saying everyone has to go to Vietnam to fill it, but I’ve seen people go who said they would never go, and come back changed. The question is why wouldn’t people want to grow and change? I can’t imagine being stuck in that timeframe when my father died. I know that the stories we brought back from the first trip helped others. Some can’t go or don’t want to go, but I still think they want to hear the stories. Susan at the Washington, D.C.
What do you want from this trip? I hope this time around that we reach more people on both sides. And I hope it opens other opportunities for us to work with other generations. We’re all getting older, entering our 50s and 60s. We’re starting to lose sons and daughters. I wouldn’t want someone to miss an opportunity to change or to heal, if they wanted it. Whether being there physically or hearing through others’ stories, words change people. And hopefully the words we bring back bring healing and hope. It has been more than 50 years since Commander Donald Richard Hubbs, a Navy pilot, launched his aircraft from the USS Yorktown in the Gulf of Tonkin and, one hour into flight, disappeared off the North Vietnam coast. His daughter Jill was 10 years old when her father became missing in action. Years later, in 1993, she traveled to Vietnam on a quest to find any information about her father. Since then her interest in the war and its aftermath has only grown. As Director of Educational Services and Outreach at WSRE, one of the U.S.’s premiere PBS television stations, Jill was one of the first to see the Ken Burns documentary series about Vietnam. She’s a filmmaker herself, producing, among other films, “They Were Our Fathers,” which features interviews with sons and daughters who lost fathers on the U.S. side of the war. And Jill is an avid supporter and fundraiser for “The Wall South,” a permanent half-scale replica of the Vietnam Veterans Memorial dedicated in 1992 in her hometown of Pensacola, Florida. In this profile of one of the “seven sisters” going on the 2018 2 Sides Project trip, Jill talks about her father’s disappearance, the evidence her family later uncovered that indicated he may have survived the crash, and the hope she’s bringing on this trip. When was the last time you saw your dad? When he was leaving for his second tour of duty in Vietnam in 1967, just a few days after Christmas. We waved to him as he stood on the deck of the USS Yorktown. Back in the car, I discovered the cake that my grandmother had baked for him – a lemon pound cake, his favorite. I begged my mother to let me run it back up to him, and she did. He took the cake, gave me a hug and told me to be good girl and take care of my mother. These words have became the marching orders that have echoed in my ears ever since. What do you know about the circumstances of his death? He went missing in action during a mission over the Gulf of Tonkin in North Vietnam. He and his three crewmates flew an S-2 reconnaissance aircraft off the deck of the USS Yorktown. One hour into their flight, the plane disappeared off the radar. Five hours after the last contact, radio signals were heard, and North Vietnamese fishing boats were spotted in the area the next day. My dad was declared missing, but I knew that other people in his squadron were searching for him, so I felt they would find him and everything would be ok. I was so young I don’t think I really understood the gravity of the situation or that my father was serving in a war zone and that America was fighting the North Vietnamese. Your father’s disappearance ended up being a high profile case. We waited for news for days, which turned into weeks, then months, then years. In 1969 my mother and I identified my father in a North Vietnamese film of American POWs, but he didn’t come home when other POWs were released. In 1987 we received a live sighting report from the Defense Intelligence Agency stating that their credible source had seen my father alive being held with 13 other Americans near the city of Da Lat. Three years later I sat with my mother in the Senate Select Committee hearings on POW/MIA affairs and heard President Nixon’s defense secretaries testify that the U.S. government believed some American servicemen had not been returned, but had been left behind. That must have been absolute hell. Never knowing what happened to my father, living in uncertainty, was so very hard to cope with. My mother’s heart was broken, but she was my hero, making sure that my sister and I were raised in a healthy and happy home and in a way that would please my father. She carried on despite the obstacles, the heartache, the limbo. She had a very strong faith in God. That sustained her. You went to Vietnam before the United States had established any kind of diplomatic relations with Vietnam. Weren’t you scared to go? My mother was very worried for my safety, but I wasn’t scared. I felt compelled to go. By the time we had received the live sighting report, I was an adult and I wanted to go to Vietnam myself to see what I could find out about my father. I traveled to Hanoi with a very small group from Friendship Force on the first ever trip to extend the hand of friendship and understanding after the war. I was unsure how I would be received by the citizens of North Vietnam, especially when they learned that my father was an American pilot who had flown missions during the war. Everyone I met was gracious and friendly, including a mother who had lost two sons, both of whom had served in the North Vietnamese Army. She took a picture of my father and placed it between photographs of her two sons and began praying for all of three of them in a loud and emotional prayer in Vietnamese. It was a pivotal moment for me, a moment of forgiveness, understanding and shared grief. I did not understand her words, but I felt her emotion, her grief and her loss. And she understood mine. Before that journey, whenever I heard the word “Vietnam,” I thought of the war. From then on, Vietnam became a country to me, a place with people who became friends. Jill, right, on the USS Yorktown next to a plane named in her father’s honor. Did you get any other clues about your dad while there? In Hanoi, I was able to locate an old Vietnamese grave registration that listed my father’s name on it, indicating that he had been buried somewhere in the province of Quang Binh. I have come to accept that I may never really know what happened to my father or ever be able to bury his remains on American soil. My mother died in 1999, never knowing the truth. What I have left are memories and the awareness that I am the legacy for my parents. It is my duty to honor them, live my life as they would have wanted me to do and to accomplish whatever I can to make the world a better place. What do you expect from this trip? I am looking forward to going with other daughters whom I have come to know and love like sisters. We are about to embark on a trip that will be life-altering for all of us, something none of us will ever forget and a journey that none of our fathers could ever begin to imagine us taking. We will also meet sons and daughters from the “other side.” Perhaps this is the most important part of our journey, being ambassadors of hope and friendship. It is a journey of the heart, a journey to embrace and honor the legacies of our fathers and a journey of peace and understanding for the future of our world. Our fathers would be very proud of us. Kim Carlson Benner’s father, Air Force Captain John W. Carlson, was shot down in Vietnam in December of 1966. His remains have never been found. Decades on, his legacy lives in Kim’s life and in the lives of the two boys she has raised with her husband, Rich. Their sons, John and James, are named in memory of Kim’s father and that of his cousin, James Donahue, who was also killed in Vietnam in 1970. In this series of profiles introducing the “seven sisters” who are going on the next 2 Sides Project trip in November 2018, Kim talks about growing up without her dad, what changed her mind about meeting the other side and going to Vietnam, and how she’s preparing for this important trip. What was it like growing up without your father? It made me feel very vulnerable. I seem to remember being scared and afraid, always thinking that someone was going to physically hurt me. I am not sure how common it is for young girls to feel this way, but that's the way I felt all the time. I know I felt sad, like something was always missing. Looking back, I think I really felt unmoored and adrift, floating alone in the world with no direction. Even though I was very young, I think in some way I knew I had to keep my sanity if I wanted to survive. Did people talk to you about the war, given your family’s experience with it? Not really. At times, I felt invisible, but when people did pay attention to me, it was because they felt pity for me ("that poor girl, her father died in the war") which made me embarrassed. I don't remember feeling particularly proud of my father and his service, or why anyone would even care. I don't even remember telling people about my father's death in Vietnam until much later. Friends of mine from high school recently found out about how my father died and said they had absolutely no idea of my circumstances. What about in your family? Was it discussed? I knew our grandparents loved us very much, but I also knew that Grandma would cry about our dad, and I didn't ask about him because I didn't want to make her sad. I wanted to make a connection to him so it would seem obvious that I was his daughter. That’s probably a big reason why I wanted to learn to sail. I knew it was such a passion of his, and was something we could share. You didn’t go on the 2015 trip. What changed your mind? I didn’t have any interest then in meeting the other side, and since we’ve never been sure where exactly my father’s crash site is, I didn’t want to go until I was certain I could stand in the right place. My feelings about the other side changed only recently. In 2017, I attended the film premiere in Washington, D.C., and several of the Vietnamese who participated in the first meetings in Vietnam came to see it. I remember Dang Thi Le Phi, a daughter from Danang, ran up to my son James. She’s tiny, and he is 6’4”. She stood next to him, marveling at his height. She is a mother like me, in awe of my child, I thought. Why am I angry at her? It was a pivotal moment. We still don’t know our father’s precise location, but I feel like it’s time for me to go anyway, and I want to go as part of the 2 Sides Project. I don't want to take a tourist trip there, and I don't want to go with any other group. How are you feeling about it, now that it’s close? I am honestly feeling so many emotions, ranging from curiosity to fear to anticipation. I am taking very small steps every day to prepare myself, which seem to be helping with the fear part. I am not sure what to expect and how to prepare, which feels kind of weird since I do like to be in control. I think if I overthink it though, that might not be good either. So I’m trying to keep my mind open and receptive and not judge my emotions. But I don’t know how I will respond when we get near the crash site. I know that my father died there, but I really do feel him with me, and know that he loves and is really proud of the family that Rich and I have created, nurtured, and loved with our whole hearts. I am really looking forward to seeing the Vietnamese friends I met in D.C. I think I am just really starting to appreciate how brave they were to come and visit the Wall. I only hope I can be as gracious, open, friendly and forgiving when I am a visitor to their country. Knowing that we will all be together again soon is very comforting, and I am looking forward to meeting other Vietnamese sons, daughters and veterans. I am praying that we can all continue to find peace and forgiveness, both individually and collectively. Nora Kubach is the writer and editor of The 2 Sides Project documentary, an award-winning film that has been airing on PBS’s World Channel all year long. A new version of the film, which includes unseen interviews with three Vietnamese sons and daughters who lost fathers on the opposite side of the war, will premiere in Vietnam in December. It’s a remarkable accomplishment to work on a lauded documentary and to have it seen by tens of thousands of people around the world. It is an absolute feat to create a story about a trip you couldn’t go on for budget reasons, about a country that you have never seen. But Nora did. And now, she’s going to see Vietnam for herself as one of “seven sisters” traveling on the next 2 Sides Project trip in November. In this series profiling the people who will make the journey, Nora talks about creating the film with Director Anthony Istrico and Director of Photography Jared Groneman, the connection she already feels to the country and to the people involved in the project, and how the recent passing of her own father has helped her focus not just on other’s stories, but on her own. So, the first documentary you write and edit gets awards at film festivals and a nationwide run on PBS. That’s crazy. I’ve been reflecting back on the last few years. It’s been exciting, and overwhelming! Working on this film has really been the highlight of my career thus far and I’m honored that Anthony trusted me with the narrative. I was able to attend a few private screenings and the West Coast premiere, where I got to see reactions and meet people who saw the film. It was just amazing to see how emotional it was for Gold Star children, for veterans, for everyone. I already knew it was a powerful story, but seeing the response live was so great. I’ll never forget it. The power of art is, well, powerful. Yes, it is! Art connects us all. It helps us express ourselves when we don’t have the words. It brings out our humanity. It can create real change in the world. I studied theatre in school, and we always talked about why we create, what we want from the audience. I was young and idealistic, but I had a noble idea of the theatre. I loved performing so that I could live as other characters and find empathy in them. I felt it was our job to entertain the audience but also to give them a different way of thinking, or an emotional release of some kind. I’ve always believed art, whether a film or a play, a novel or a painting, should strive for that. The 2 Sides Project film really brought me back to that time when I was creating something with a purpose that brought people together. I could see pieces of myself in everyone’s stories. And I saw the ripple effect of the film on others, and how it changed people’s way of thinking. I’m most proud of that. What you are most excited for about the trip? It’s strange to feel so close to a country I have never set foot in. I didn’t grow up with a personal connection to the war or to Vietnam, so I never had an emotional tie to it until the last few years. It feels like such an important part of my life now. I can’t wait to be with you all on your own personal journeys, to meet people on the other side, and to see the beauty of the country in person! As I was working on the film, I couldn’t help but think of Joseph Campbell’s “Hero’s Journey;” you left this country feeling one thing, and through all of the trials came back with a new knowledge about yourself. That is so powerful to watch, and I know there are more emotional journeys to come. I feel so connected to all of you and am glad I will be there to support you and to help people make the connections as best I can. You’ve had a challenging year, with the recent passing of your father. Does that change your feelings about going so soon after? My dad died suddenly, and I’ve had a tough time. I did not expect to go on this trip and feel a sadness of my own. Working on the film was cathartic. Like many people, my own father/daughter relationship was complicated. From a creative standpoint, I wanted everyone to be able to relate to this story in some way: not only those who were affected by the Vietnam War, but really anyone who has lost a father and feels an emotional void. I wanted to explore in some small way what it means to be a son or a daughter, and to work through your feelings about that. I’m glad my dad was able to see the film and I know he was proud of me and everyone involved. I know you all didn’t have your dads for much of your lives due to the war. I can’t imagine, or compare with your experience. But I do need this trip now. It’s important to start moving forward and healing. The best way to really do that is to get out into the world and live your life, share your story, and realize you’re not alone. I’m grateful to my family and friends for supporting me on my own journey. Does it change what you expect from the trip? Travel, just like art, opens the mind and helps you form connections and think bigger about your life. When I travel, I’m reminded of how beautiful life is, how much the world has to offer. I’m not going with any goal or expectations. I’ll be bringing a camera, but I will strive to not hide behind it. I have my own story to write and my own healing to do. So I hope I will be able to be present for myself, and make some incredible memories. Barbara Brumet is a physical therapist living in San Diego, and a specialist in treating people with disabilities. She’s also the daughter of Air Force Captain Robert N. Brumet, who was killed on April 9, 1964. Captain Brumet died in the very early days of the war under circumstances that, when she talks about it today, more than 50 years later, still make Barbara’s voice tighten with anger. In this first of a series of profiles that will introduce the participants in the 2 Sides Project 2018 trip to Vietnam, Barbara talks to 2 Sides Project Founder Margot Carlson Delogne about her father’s incident, her previous trip to Vietnam to visit his crash site, and why she’s returning for what will be a very different experience, this time with her sister, Bonnie Dean. Tell us more about your father. My dad dropped out of high school in 1944 near the end of WW II and joined the Marines. He was offered a spot at Annapolis, but declined it and returned to his home town in Idaho. He knocked about for a while and then entered the Air Force as an enlisted radio man. During a trans-Pacific flight, the navigator had a heart attack and died, and my dad had to suddenly fill two rolls. After landing, the pilot offered him a favor for stepping up, expecting to grant some extra leave. Instead, my dad asked to go to flight school, and that’s how he became a pilot and an officer. They called him Grandpa because he was older than most of the guys due to his circuitous route to pilot and officer. Air Force Captain Robert N. Brumet on base, 1963. What led up to your dad going to Vietnam so early in the war? Both of my parents were in the Air Force, stationed in Japan. They first met at the Officer’s Club on base. They were each due to be reposted and knew that if they were married, the Air Force would keep them together. So, after dating for just six months, they had that fish or cut bait conversation, and decided to go fishing! My dad left for Vietnam seven years later. This was toward the end of 1963, right around the time of all the chaos of the Kennedy assassination and the killing of the South Vietnam President Ngo Dinh Diem. My father was considered an advisor, because he was there before the U.S. was officially involved. I was six years old at the time. My father wasn’t killed by the Vietnamese, but by poor equipment and bad decisions. He was flying a T-28. Those planes were used for training, and were never designed to carry ordinance, but they packed them up with bombs and sent the pilots out on runs. That day, he went out with another group of planes, and during the last strafing run, his wings fell off. His plane crashed. He and a Vietnamese observer were killed, but they weren’t the only ones to die as a result of the accident. One of the plane’s wings landed on a house and killed a Vietnamese woman and her four children. What was it was like growing up without your dad? We were kept in the dark. I come from a family where you just didn’t talk about it. We were raised to keep our mouth shut and our head high and put one foot in front of the other. So I never said anything to anyone. Years later, I was working in a clinic and one of my patients was going on about the war. I told him my father had been killed there and he looked at me and said “Well, he was just stupid then. He died for nothing.” I didn’t know what to say. I was so stunned. When I look back on it now, at all the things my father missed like the birth of my children, the weddings, it seems to get even harder. A newspaper article describing incidents involving overloaded training planes, including the accident that claimed Brumet’s life. En route from the Imperial Palace in Hue, the first time. You have been to your father’s crash site once before, is that right? Yes. I went to Vietnam in March 2008 with a group that included mostly war veterans from the U.S., but also two brothers who had lost their father in Laos. I went to the site where my father’s plane crashed. It was Easter Sunday. I didn’t see what was coming. We went to the place where the fuselage landed. And then we went to the place where his wing crashed. The house it had destroyed had been rebuilt. The family that had been killed was buried in the backyard. But the husband was still living, and he was there when we arrived. He had been working in the fields the day his family was killed. We couldn’t communicate with each other with translators, and I could tell he was very angry when he found out who I was. It was very difficult. Captain Brumet in flight, 1955. I’ve been talking to my sister and planning to go back with her. Then last year around this time I attended the West coast premiere of The 2 Sides Project documentary, where you talked to me about the next trip. And I thought I would get so much more out of it going in a group with others who had lost their fathers, and meeting the Vietnamese side. I can’t tell you how thrilled I am that it all worked out. How are you feeling about it, now that it’s approaching? I’ll be honest. I feel some trepidation. The first time I was only going to one casualty site. It was one thing carved out of a whole trip. Now it’s a focus, and I’m a little worried how I will handle going to so many sites. What do you hope most for the trip? I’m glad we’re going to see some hospitals, because after I retire I want to do medical volunteering to help people who need physical therapy services. I want to meet more people who share my experience. I spent years not talking about it. Now I’m trying to make a point to talk about it, to be more open. And I want to meet more Vietnamese people. The last time I went, I hired a scooter and went to the Saigon Zoo. I walked by some school groups and they went dead silent, watching this tall American with long blond hair walk by. This trip has a lot more interaction with the Vietnamese, and I’m looking forward to that. Vietnam isn’t your only destination this time around. Where else are you going? I’m starting my journey before everyone else in early November. I’m making the most of the long flights and will visit India and China before heading to Hanoi. And after Vietnam, Bonnie and I are going to visit Japan. When my parents left that country, my mother was pregnant with me. Japan has always been on my bucket list, so I’m really excited to go.